Few toys remain popular for over 50 years like the Easy-Bake Oven has. Decade after decade, this pop-culture icon has struck a note with kids and adults. It’s even been inducted into the National Toy Hall of Fame. 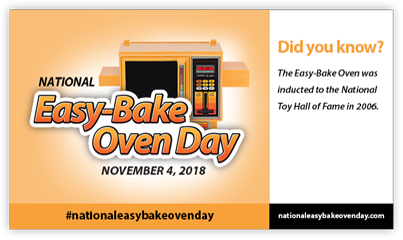 Whether you’re a new fan, a collector, or know someone who is, National Easy-Bake Oven Day and this website will help you share the love of this enduring toy. National Easy-Bake Oven Day recognizes the enduring legacy of the iconic toy oven. Get crafty with this fun project! 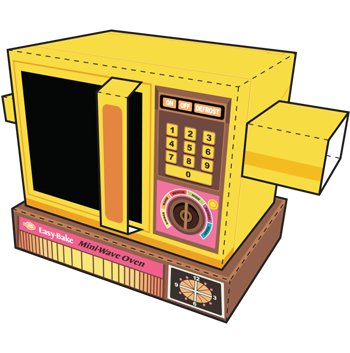 Download, print, assemble, then proudly display your miniature vintage oven. Share National Easy-Bake Oven day with your friends – choose from 6 fun Easy-Bake Oven e-card designs. about National Easy-Bake Oven Day. Easy-Bake is a registered trademark of Hasbro, Inc. and used in this site solely for identification purposes. Hasbro Inc. assumes no responsibility for the contents of this site. 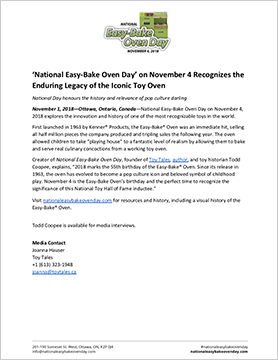 National Easy-Bake Oven Day is not sponsored by or associated with Hasbro, Inc. or its affiliates.